During Axacon weekend, the temporary solution was to rent a portable power generator and park it outside in the lot behind the studio. The contraption was huge, and it ain’t cheap to rent, let me tellya! 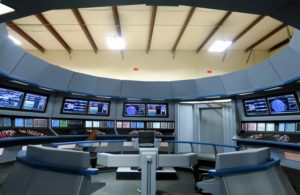 But Alec wanted the bridge fully lit for the grand unveiling, with all the monitors showing animations and all of the console panels lit and glowing. However, renting a giant power generator every time someone wants to turn the lights on won’t be financially feasible. So what’s using up so much power…? First, there are the 14 large 40-inch TV monitors above each station. They require .75 amps each. So that’s about 5% of the total energy usage right there. Then there are 52 computer monitors at eye level. Those actually don’t eat too much power, but you know what does? Twenty-four computers to run all of those animations! Those need about 5 amps each. Do the math, and we’re now well over using half of the electrical power available…and that’s before bringing in large studio lights at about 8 amps each (although LED lights draw about a third as much power). Oh, and there’s also lights all around the set itself to make the consoles glow. Ad in sound equipment and various other devices plugged in around the studio—heck, even the coffee maker needs juice (get it? )—and those 200 amps disappear real quick! So as you can see, there’s a lot of variables for Mr. Scott (well, Mr. Simpson…JAMES SIMPSON is figuring out all the electrical challenges) to figure out in order to keep the ship and all its systems at full power without blowing the circuit breakers. Can our chief engineer work a miracle? Actually, yes, and it’s as easy as Raspberry Pi! 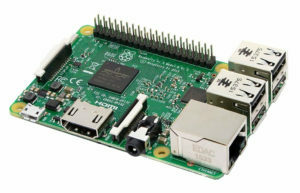 The Raspberry Pi is a computer circuit board that fits into the palm of your hand. First developed about 6 years ago, it has no surrounding case and uses minimal power (fractions of an amp). But you can load it up with software, plug in a mouse and/or keyboard, connect a monitor, and it’s just like a normal computer but with a fraction of the power usage. Anyway, those 4 holes are going to be filled with static-image, specially-fitted plexiglass panels…just like the ones used for the console buttons. 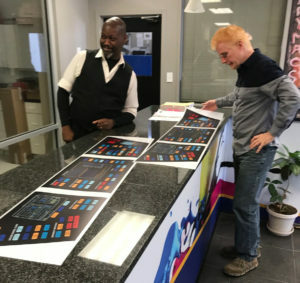 Axanar printer (and Benjamin Sisko impersonator) JOE CAMPBELL used custom graphics created by designer ALEXANDER RICHARDSON and had them reverse-printed onto plexiglass to be partially translucent to light. 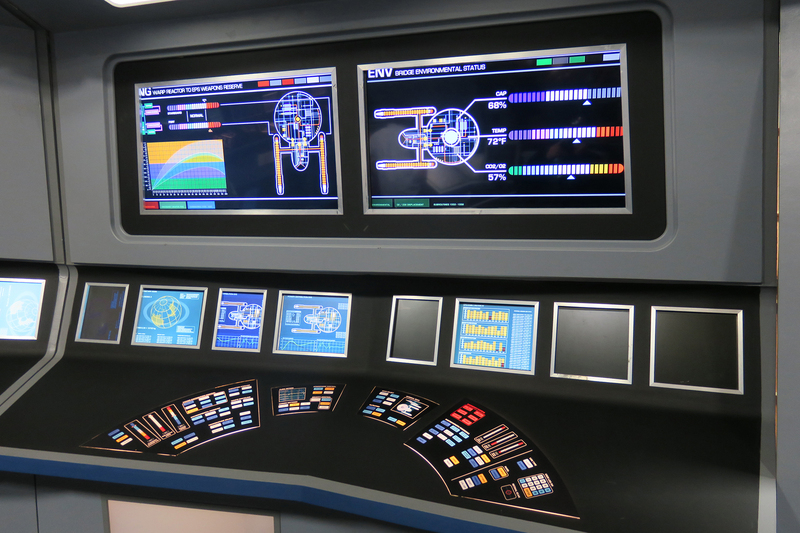 When lit from behind or below, the black stays black, but the colored areas (buttons, ship schematics, etc.) glow. It looks really good, and you don’t really miss the computer animation. The other 10 monitors being replaced had a more unusual problem. Due to the layout of the “squares,” there wasn’t space to mount them all next to each other horizontally. Some had to be pivoted 90-degrees to sit vertically. Unfortunately, these are the old-school type monitors with 4×3 aspect ratios that predate LCD technology. So they draw their images one line at a time the way older television and computer screens used to. 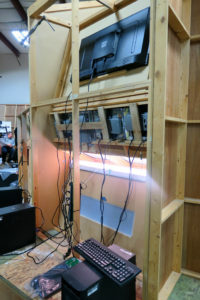 While the sets were still in California, early screen tests showed that the vertical scan lines ended up looking awkward on camera, and Alec has known for quite some time that these monitors would need to eventually be replaced. Fortunately, the plexi solution has proven quite elegant. So with only 38 computer monitors left after the swap with plexi, plus the 14 large-screen TVs, plus the Raspberry Pis, the total power consumption is now down to just 77 amps. This still doesn’t include the lights behind and under the consoles yet, as many of those still need to be installed (and there will be a lot of them)…possibly florescent, possibly LED. But it’s looking like Alec will be able to get his “flick-a’switch” bridge after all! The other “miracle worker” helping to finish up this amazing bridge set is DANA WAGNER. Like James Simpson, Dana lives locally and has a flexible schedule, allowing him to come in to work on bringing this project to completion. Dana has already put in countless hours, rushing to get as much of the bridge competed before Axacon as possible…but he didn’t quite make it. Among the things left unfinished were the final details of the button panels at all of the main stations. As you can see from the image above (which I took during Axacon weekend), the plexi panels were roughly cut and didn’t fit perfectly into their slots yet. So there were visible outlines of the under-lighting “leaking” around the edges of the button panels. Dana’s job now (well, one of them), was to use his fancy new router and sander to make certain the panels fit in like a glove. Then James had to paint the edges of the slots a dark black to ensure that no light would bleed though. Dana’s mission at these two stations is to cut out all of the holes (just as he did with the other consoles), rout and sand each one for a perfect fit, and then paint the edges black. Sounds easy, right? After all, unlike the circular panels at the other stations, these two consoles have straight edges. 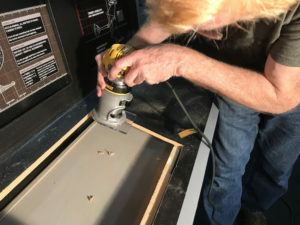 As Dana discovered after cutting the first hole, there was a wooden beam running under the bottom of the console surface. 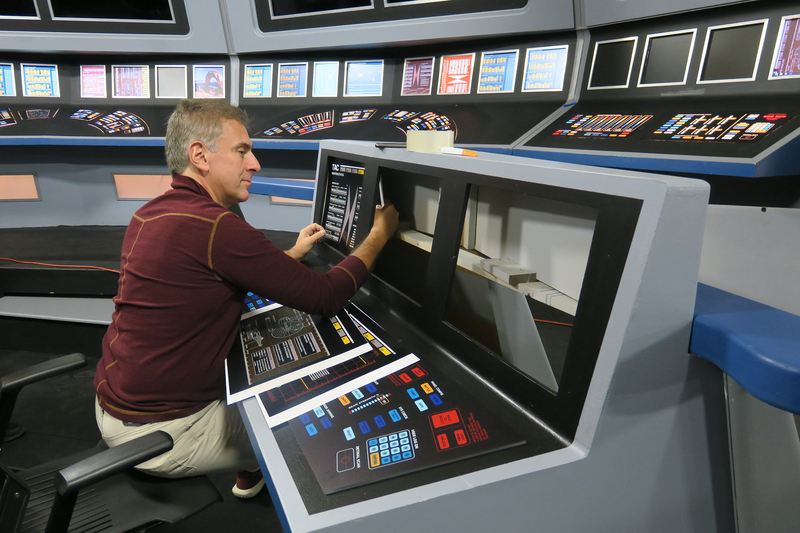 Dana couldn’t risk cutting through the beam without compromising the structural integrity of the entire set piece. According to Alec, it took a long time trying to get the opening just right, but Dana managed to do it. One down, five to go! Alec also posted this video update showing most of what I’ve just explained. It’s fun to watch and very informative, and it’s had nearly 25,000 views in just one week…! Anyway, although things aren’t quite finished yet, they are SO VERY CLOSE! However, as you can see from the updates above, even after running 25 miles of the marathon, that last mile can still be a challenge. So yes, it’s taken a long time to get from there to here. But just think about all this magnificent set has made it through (in addition to just being constructed out of wood and nails): a year-long lawsuit, finding the right electronic equipment and buying it, disassembly for a move across country, reassembly, finding skilled volunteers in the Atlanta areas with free time to donate, designing the graphics, plexi print tests, camera tests, painting, electrical wiring, replacement of broken equipment, plexi printing and fitting, routing and sanding, more painting, flooring, figuring out how to meet power supply requirements…and it’s still not over yet! But soon it will be. 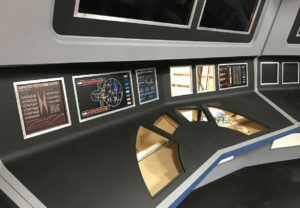 One of the most impressive fan film sets created thus far—right up there with the TOS sets in upstate New York, the ones in Georgia, and those in Arkansas—will be ready for folks to film on. And film on it they shall! Oooh, very cool! I can’t wait to see the end results! I have been thinking, what happened to quasi-old school green screen displays? The more of them you use, the fewer monitors and computers to run them, right? The only problem with green screen monitors is that you really can’t move the camera much without increasing the workload of your compositor a hundredfold. Leave the camera mounted on a stationary tripod and you can fairly easily replace any green screen “monitor” with the display or animation of your choice. But pan or tilt or zoom or rotate or shake the camera, and that nice clean rectangle becomes a “moving target” trapezoid or parallelogram or rhombus…and the animations inserted into the composite shot have to be resized and angled and moved frame-by frame in order to track properly. Also, I was surprised to hear fluorescent sources even being mentioned. Fluorescent lighting emits a discontinuous light spectrum with some prominent peaks. The result is that these lights can play havoc with colors, generating color casts and problem mismatches with other sources. But, of course, it’s LEDs that were chosen – ideal in so many ways. 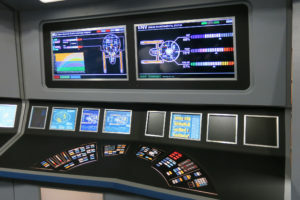 The florescent lights were located primarily below the panels to help the buttons “glow.” The lights weren’t casting on anything but rather providing light that would only be seen through translucent colored areas. Sigh. I know this is heresy, but I can reduce the current to zero! Replace all screens with green screens and CGI the graphics in post-production. You might want to have a few real screens, especially if you have any very dark scenes, just so the screen colors reflect a bit onto real objects. But really, are all the R-Pis and real screens really necessary? Well, I suppose it looks much better during Axacons, am I right? See my answer to the first comment on this page, Fred. I don’t understand the snark, Fred. I have a very, very minor part in a play being filmed by friends (not SF, sorry). It involves walking on stage, shaking someone’s hands, saying “thank you” and walking off. Well, it turned out to involve much more action when we started rehearsing it, but that was the basic idea. Last night we had the first technical rehearsal. Those who have been involved in such things will know exactly how much fussing with lighting is required to get things right for how the three cameras will see the result. And how much fussing there is in consequence with the blocking because the cameras don’t like what the director wanted. So I was nodding yes, YES, ***YES*** as I read this blog post. I once went to a taping of Voyager at Paramount. I think it was the episode “Swarm.” They had to film a sequence where Kes walks onto the bridge and tells Janeway something and Janeway reacts. Then the ship gets hit (in other words, someone off camera yells “JOLT!” and everyone shakes). What turned into about 20 seconds of footage in the final episode took nearly three hours to set up and film! I found myself wondering how they managed to shoot a full 45 minute episode in just eight days??? Worked with Dana today as he routed out the Strategic Operations Console and he is a master of the router working it to make the appropriately sized openings to slide the plexies into so they fit nice and straight. The monitors and Piis work amazingly well thanks to all the tech guys led by James, as a non-tech guy it’s pretty cool seeing these guys applying their talents to this project. 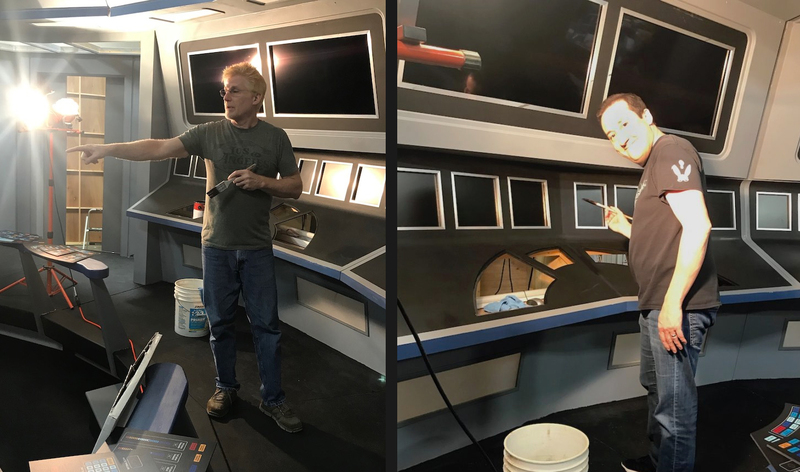 The camaraderie among all the volunteers is amazing and the spirit of Axanar is in full force. Once this project is completed fans are going to be amazed at the level of sophistication and realism achieved! I love going into the studio and being around all these dedicated fan/volunteers the enthusiasm is contagious! Axanar Rising! Axanar Rising, indeed! Thanks for volunteering your time to help bring this project to reality, Dale. Very happy for you and the bridge set is beautiful. The people who designed and built it did a great job blending old and new. My question is why the sudden rush to complete? Have they decided they DO want to use it in the 15 minute episodes? Last I heard they were not going to and they were going to film them in LA. Speaking of them, what is the status of the two 15 minute episodes? Will the bridge be used in Axanar or is something else going to be filmed on it? Previous Previous post: VOYAGER CONTINUES: RAVEN is now STARSHIP PROMETHEUS…adds new CGI footage! Next Next post: Star Trek STUNT DOUBLES doubles its offerings!